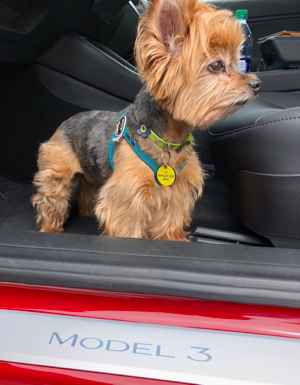 The Yorkie Claire accompanied me to a Supercharger today in Hadley Massachusetts, conveniently located just a mile from the Paradise City Arts Festival, a favorite event of my wife Darlene's. Fun for everyone. We drove about 100 miles from Cambridge to the festival, near Northampton. This was my longest drive yet, and it gave me a good chance to settle into familiarity with AutoSteer, automatic lane changing, and enhanced cruise control. At one point I realized that I was driving less well than the AI could. Not always, and not in every situation. But on a stretch of road without exits that puzzled the Autopilot, with average traffic--that's when the Autopilot seems safer than my own driving. I also met a guy Miles Andrew Chilson at the charging station who is an administrator of the Tesla Owners New England group on Facebook. My application to join is pending.